2). I knew my co-author, Betsy Bird, had reviewed Fortune Cookies at the end of January, yet I didn’t read the review then. I mentally flagged it to read at a later time, knowing I was probably going to cover the book here. So, I just now up and read that review. And wow. There’s a reason you want Betsy to cover one of your books: Her reviews are remarkably detailed. Will you forgive me then if I just send you over there to read her thoughts on the book? Having just read her thoughtful analysis, I feel I have no other choice in the matter but to send you to the best. (No one quite gives these slim picture books the consideration and scrutiny they deserve quite like Betsy does.) So, dear readers, if you’re really interested in learning more about this title, I give you Betsy’s thoughts on the matter. She covers it all: Albert Bitterman’s real name and day job, the rise and fall and rise again of novelty books, what makes a good one, why Fortune Cookies is an effective one, why it’s notable how dang sturdily the book is made, and even how the book can be seen as commentary on free will. The only difference here? While she talks about her sometimes-distance from Raschka’s art, though she notes she’s always respected his work on the whole, I could confidently be described as a big ‘ol fan of his minimalist illustration style, his loose watercolors and the way he “captures the essence of a mood with the merest hint of text and the briefest of brush strokes,” as Publishers Weekly once wrote. 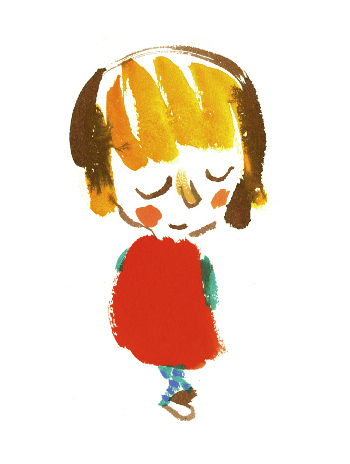 When it comes to contemporary picture book illustration, his work is one of My Bests. If you’re in the same boat, here’s a link back to my 2009 interview with Raschka. I would be remiss, however, if I didn’t tell you what-in-the-what-the this book is about. 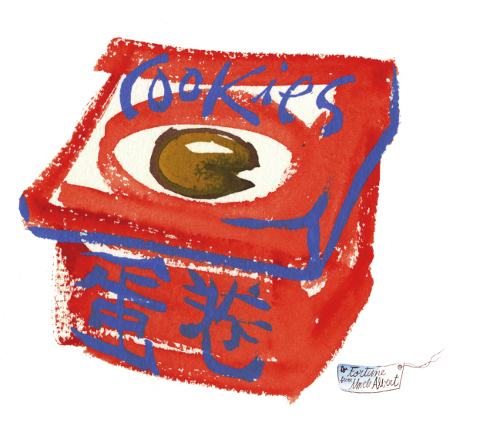 Why, it’s about a young girl who receives a box of fortune cookies in the mail. 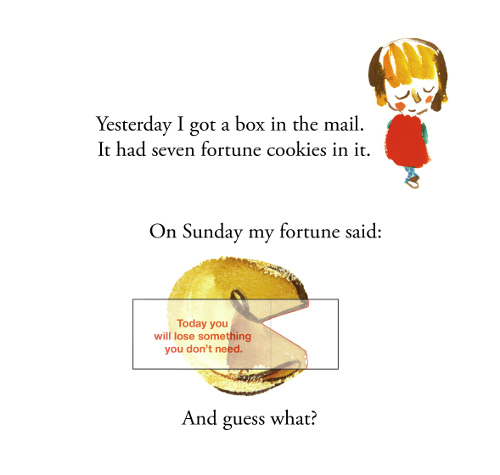 One pulls the tabs in the book to read the fortunes, the girl opting to read one each day of the week. Life starts imitating art—er, fortune cookie wisdom, that is—when things start happening/happening to her that echo the previous day’s fortune. (“I lost my kite, but . . . I found a cat. So I brought her home. On Wednesday my fortune said: Don’t hide your feelings. And guess what? My cat disappeared. I cried and cried.” Publishers Weekly calls this one a “tidy, perfectly paced story with subtle grace and a kernel of wisdom.” If I may, I shall add that Raschka Kittens are also just fun to look at. Here’s a bit more art from the book. Enjoy. And, again, don’t miss the Cybils winners. Note: The post’s title is a reference to The Simpsons episode in which Homer visits a Chinese restaurant, complains about the unimaginative fortunes in the cookies, and becomes his own fortune-cookie writer. Has nothing to do with this book, but one simply cannot squelch one’s Inner Simpsons Nerd. FORTUNE COOKIES. Copyright 2011 by Albert Bitterman. Illustration © 2011 by Chris Raschka. Published by Beach Lane Books, New York, NY. Interestingly, when I saw the title & Raschka’s art, I thought this new book coming out next month was going to be featured!? I haven’t seen this one yet. Clearly, I must. I am rendered mute by sheer appreciation! !